Witnesses: crew of USAF B-47 jet bomber at 34,000’ altitude. One object with running lights flew at 24-44,000’ altitude for 1 hour. June 1, 1954. From 400 miles S to Minneapolis, Minn. 9 p.m. Crew of USAF B-47 jet bomber at 34,000 ft altitude saw object with running lights fly at 24,000-44,000 ft altitude, pacing the B-47 within 10,000 feet of its 34,000 foot cruising altitude as it flew 400 miles north to Minneapolis, varying its height both below and above the aircraft. Sparks also describes this case as a possible Radar-Visual. The sighting began at 2100 Central time (it is not specific if this is standard or daylight, this means 0200 or 0300Z - BB says 0300Z/CST) about 400 miles south of Minneapolis Minnesota. The B-47 flight was enroute from Barksdale, LA to Minneapolis, where it made a turn around 2205 Central time (0305 or 0405Z). At this point the object disappeared from view. The aircraft was at 34,000 feet and the UFO was estimated to be between 44,000 and 24,000 feet. A B-47 trailing the aircraft was asked to turn off its running lights to make sure it was not the same object. The UFO did not disappear. The trailing B-47 observed no object near the lead B-47 and did not report any object following him. There was no radar contact. This refutes Sparks’ claim that it was a radar-visual. The flight path was essentially true north. We are not told which direction the UFO was located but Sparks’ implies it was “pacing” the aircraft. The message states it was “fol- lowing” the aircraft. Exactly, what does this mean? Was it behind or to the port/starboard of the aircraft? This would be important to evaluate the cause of the sighting. The fact that the lagging B-47 could not see anything ahead of it means the object probably was to visible to port or starboard of the lead aircraft. If it was to the port of the B-47, then there is a probable explanation for this sighting. It is interesting that the planet Venus, at magnitude -3.95, was setting in the west (azimuth 296-306) between 0300-0400Z. About the time the UFO “disap- peared” (0405Z), Venus was very low and would be fading as it set at 0415Z. The only problem with this explanation is there is not enough information in the message to ascertain the direction the object was located. Therefore, we the best we can classify this case as “insufficient information” with the possibility of it being Venus. Sparks, Brad. Comprehensive Catalog of 1,700 Project Blue Book UFO Unknowns: Database Catalog Not a Best Evidence List –NEW: List of Projects & Blue Book Chiefs Work in Progress Version 1.26. Jan. 31, 2016. P. 189. Ireceived an E-mail questioning my reevaluation of the Blue Book (BB) case involving the BOAC stratoliner on June 30, 1954. In my BB case review, I had rejected BB’s explanation of Mars but then decided to classify it as “possibly Venus”. At the time I reclassified it, I simply did not recognize it for the case that had been previously examined by Martin Shough and was considered a UFO classic. Because of this, I felt it might be necessary to explain why I classified it as “possibly Venus”. First of all, one must remember I classified it as “possibly”. This is a classification that I use for a case where something was a possible source for the sighting. 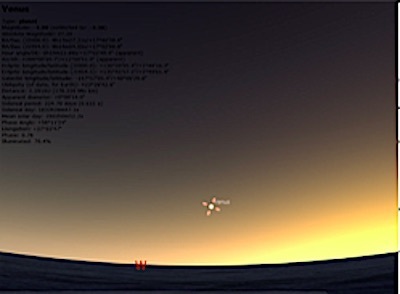 In this case, Venus was visible for the time given and the direction the pilot was looking. Therefore, one has to consider it “possible” that Venus might have been the source. utes of sunset. Its brightness was -3.95. It is possible that the window the pilot was looking through may have distorted Venus or Venus was seen through some atmospher- ic haze/distant Cirrus clouds. There may have been ice crystals formed on the window as well (this was over Canada and at a high altitude). The end result would be that Venus could appear not as a point of light but as a large object with smaller objects attached. Considering this a possible solution, I then chose to move on to the next case in my evaluation list. When I received the e-mail questioning the classification and pointing me towards Shough’s analysis, I decided to review his analysis again.1 I had read this some time ago and mentioned in the “Who’s blogging” section of SUNlite 2-2. In retrospect, I should have been more thorough and looked at Shough’s analysis when I examined the case and simply referenced it in the review of the June 1954 cases. I found it interesting that Shough did not mention Venus but, instead, made a case for this being a mirage. Shough also provided some additional information not found in the BB file. The sketches by the pilot were interesting and show that I was correct that he was looking towards the port wing and not directly to port. However, the sketches shows the object being dark. If it were dark, that probably would eliminate Venus as the source and put greater weight towards Shough’s mirage hypothesis. While I think the Venus explanation had some merit, these sketches make me consider that Shough’s hypothesis is more likely.